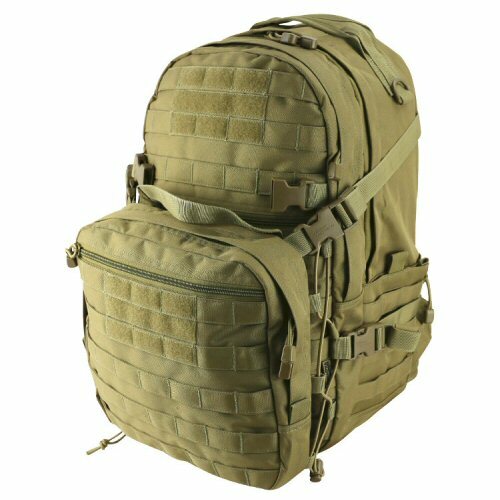 Designed as a 2 day pack, the Tan recon pack features MOLLE front, two main compartments within the main body. The main body measures 27cm wide by 47cm long. 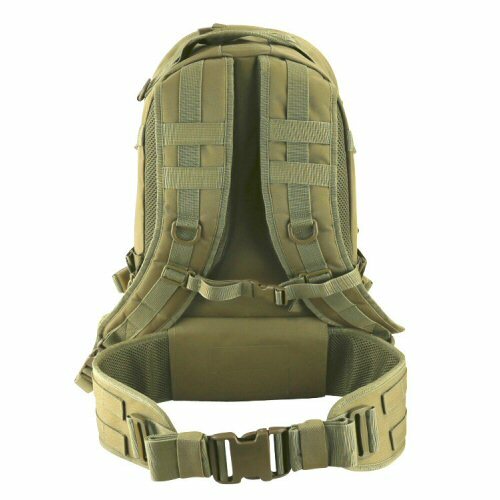 The compartment closest to the body has an internal pocket with strapping on top which allows for a hydration pack to be strapped in place. The front compartment is separated by a foam pad enclosed into the fabric of the pack, and a net pocket is provided on this separator. Both compartments are opened from the top with double zipper that opens over the top and half way down the sides. 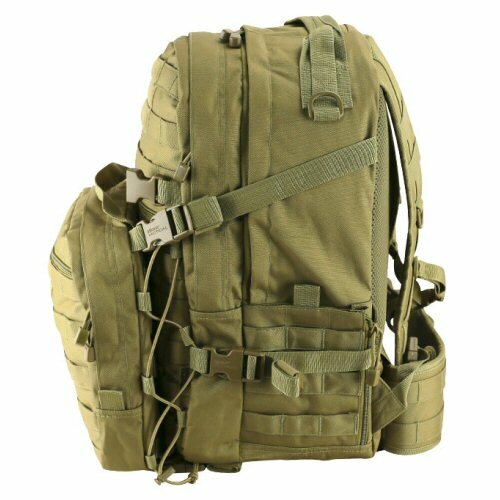 Quick access side pockets are found on left and right of the pack which are fronted with MOLLE and can be used to carry cards, documents, a small bottle or other utilities. 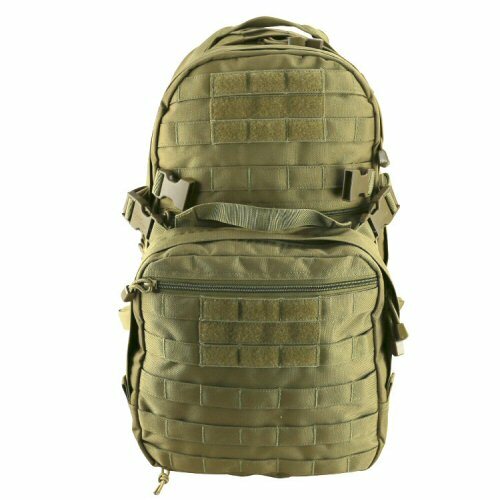 The front of the pack has a zip pocket and is fronted with MOLLE. A loop velcro panel is provided on the top that measures 7cm tall and 12cm wide. Shown in the front is a detachable MOLLE wallet that measures 26cm wide, 27cm tall and 5cm deep. This opens with a double zipper over the top and contains a sewn in pocket with organiser for ID, notebook, pens and utilities. The front of the wallet also has a separate zip pocket, velcro panel with detachable polymer, colour matched flag patch and detachable plastic carabiner. The wallet is held in place with easy to withdraw shock cord and four quick release buckles. The pack has quick release compression straps at four points (two left, two right). The shoulder straps are 9cm wide and are padded over the top. The body of the pack has deep shoulder blade padding with a channel in the centre to allow ventilation down the spine. The removable waist webbing is 11cm wide, fronted with MOLLE and closed with an adjustable 50mm quick release buckle. The shoulder strap has an adjustable chest strap with 20mm quick release buckle and two D-rings for carabiners. The top of the main compartment has a sturdy carry strap for quick carry. This is a well designed pack for many applications, small enough for a quick bug out or carry on luggage but with the capacity for several days' supplies. The front of the pack showing the main compartment with the the wallet mounted on the front. Side view of the pack showing the pack with the wallet mounted on the front and showing how it is fitted to the front of the pack. The strapping on the pack.